This is not a shallow list of Google’s ranking factors; that would have been too vague. I wanted to instead gather all photography SEO ideas and turn them into straightforward actions to improve your site in Google’s eyes. Prepare to take some time to go through this entire list and put in the hard work, all toward a photo website that both users and Google will love! Some of the actions are gathered from my 60+ Photography Website Mistakes guide while others are the result of tens of hours of extensive research. You will be learning SEO basics and more advanced tactics, how to avoid common SEO mistakes, how to increase conversion rates and promote your photography website online. Many of the actions below assume you also have a blog. From an SEO point of view, a blog certainly offers a lot more content for search engines to “digest”, it can help you rank higher in search results for certain keywords. It would have been pointless to try to repeat these great pieces of content, or just put out a list of Google’s ranking factors. I wanted instead to extract all the photography-relevant ideas and turn them into clear actions you can take to improve your photo website in Google’s eyes. 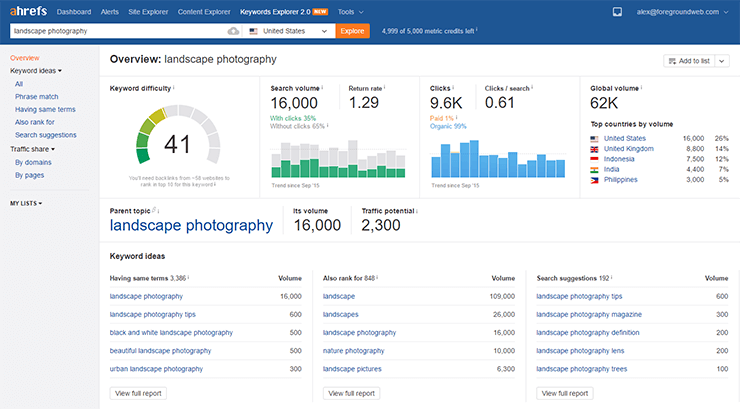 If you’re overwhelmed by all of this and would rather hire an expert to handle all the SEO work for your photography website, check out my complete SEO review service for photographers. I’ll give you all the help and clarity you need to rank higher in Google. Given this great diversity of ideas, I’ve tried to estimate their importance, as well as difficulty and time to implement. 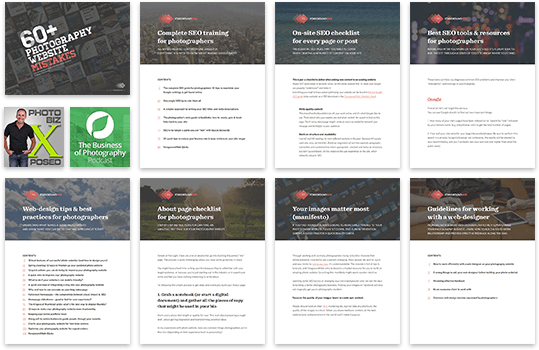 I’ve also tried sequencing them in a logical order, to make it easier for you to progress through them as you build or improve your website. One of the mantras here at ForegroundWeb is to always start with WHY? 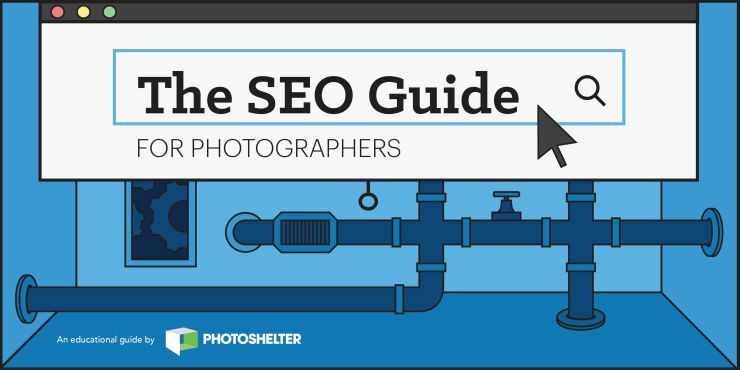 Photographers are very creative by nature, so SEO understandably falls under the gloomy area of “technical stuff”. But the fog is starting to lift. The SEO industry has definitely matured over the last few years, and Google’s algorithms are becoming easier to understand. It’s true that many SEO aspects require some technical experience, but the SEO grand-scheme-of-things is becoming simpler. By many estimates, there are over 200 signals that affect SEO rankings (though this is likely an exaggeration). Many of them fall into the “on-site” category (page titles, header tags, on-page copy etc.) – things that you can control. The SEO community estimates that 60-80% of all click traffic goes to the first three search results. Not only that, but if users are not satisfied with the results, they’re more likely to refine their search than to go page 2 (once again, quality beats quantity). In fact, 75% of users never view the second page of search results. So ranking well for relevant keywords leads to more visitors to your site, and, therefore, more sales or clients. Not only that, but it’s one of the most cost-effective and future-proof investments you can make. If you’re not hiring an SEO company to do the work for you, and you’re handling your site’s SEO on your own, your only expense is time (unlike investing money in advertising). And all your competitors are doing it. You can’t ignore the online market changes and just hope that your photography is good enough to rise to the surface. A mediocre photographer with a properly optimized site and well captioned/keyworded images can take business away from you. So you need to keep moving forward (because SEO is a long-term game) and improve your position in the photography industry. 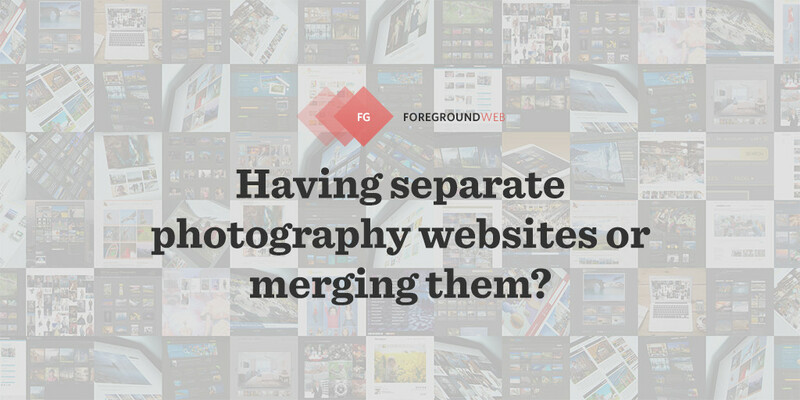 Many photographers like to spread out their online presence into multiple sites, and then having them all link back to one main website. They hope that this will help their SEO, and we can understand why: having more links is better (both in terms of number and diversity). But, in this case, it’s actually doing more harm than good, it’s losing much of the SEO value received from external sites. Let’s take a fictitious example: John Doe has his main photography website at www.johndoephotography.com (which acts as his main portfolio). But then, for simplicity, he built his blog on a separate domain (like johndoephotoblog.com) and also has a separate website specifically dedicated to selling prints (johndoeprints.com). He gets various backlinks pointing to his blog and prints sites, so this will obviously in turn help his main site’s SEO, right? That’s incorrect; the opposite is true. He is basically losing SEO “power”. If only part of those backlinks pointed directly to his main site, his SEO would be in much better shape. Those other domains are creating a (partial) barrier between brand/social signals (“link equity”) and your main website. By collecting all of the ranking signals on one main domain, you built the best possible SEO scenario. Why? Because of the ever-important concept of “domain authority”. When a domain becomes more popular, it passes its importance to all its different (internal) pages, so, in turn, they rank higher in search results. But the domain importance doesn’t get passed to other websites, so that’s basically true for the blog and prints domains in the John Doe example above. Their specific domain authority is somewhat lost when linking to the main domain. And let’s not forget about simplicity: you’re left with only one website, you can focus on it alone. The entire online marketing process becomes much easier. Branding (and SEO as well, of course) will be simpler to work on. Or sometimes it’s good to have a separate microsite for branding purposes (like promoting the images from an event on a mini online portfolio). But for SEO purposes, one single domain is best. Don’t take this lightly, there are exceptions. Deciding if you need to have one or multiple websites for your type(s) of work is critical, and should come before any other design or SEO considerations. Type: Domain factors Importance: 4/5 Difficulty: Medium Total time: Research + 10 min. You know the basic ideas: the domain should be short, memorable and, if possible, include your brand name and/or relevant keywords for your business. Photographers usually opt for their full name (johndoe.com) and sometimes add “photography” at the end (johndoephotography.com). Other suffixes (like “photographer” or “photo”) are less popular. Too many people include hyphenated keywords in their domain (best-photography-in-the-world.com), but that’s not ideal. The very small SEO benefit you get from using keywords in the domain name is nothing compared to the zero branding value you have: it’s difficult to remember, it lacks credibility. Type: Domain factors Importance: 0.1/5 Difficulty: Easy Total time: 15 min. From an SEO standpoint, it’s always best to register (or extend) your domain name for many years in advance. If Google notices that your domain is registered for more years to come, it considers it a sign of credibility. And that can give you a small SEO boost versus younger websites out there. Why? It’s because Google is always trying to fight spam websites (that don’t usually last more than a year). A blog can obviously be a powerful SEO and marketing tool, and help you establish your photography brand and attract more/better clients. But instead of using free blogging platforms like wordpress.com or others, you can gain a big SEO advantage if the blog is on your own domain. This is not to be confused with the self-hosted software from wordpress.org which gets setup on your own domain and is great for SEO. 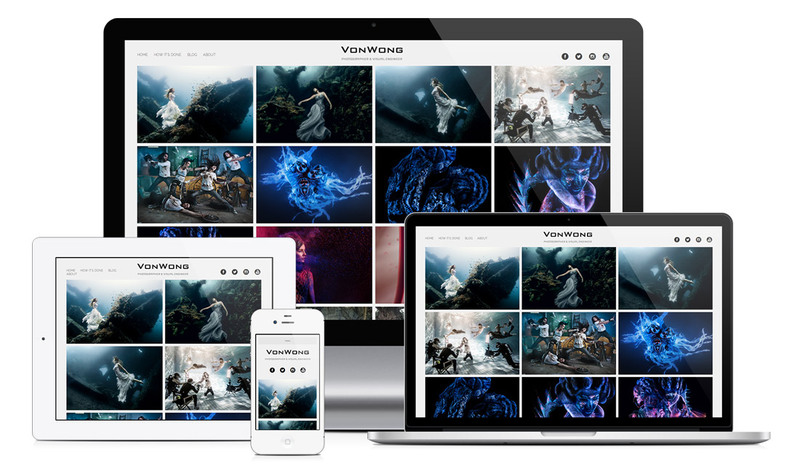 Many photographers have a main portfolio site, but an external blog. So any links you get to your blog posts won’t help your main domain’s authority. So besides the important design implications (it might be confusing for visitors to leave the main site), you’re losing precious SEO value there. Google loves good user experience signals, so use your blog to provide context to your readers: the way you shot those landscapes, the story behind those galleries, recent event/travel impressions, new photo gear experiments etc. Type: Tools Importance: 3/5 Difficulty: Easy Total time: 30 min. It would be a stretch to assume that verifying your site in Google Search Console (formerly called Google Webmaster Tools) would directly influence your site’s indexing or search rankings. So let’s not go there. But the tool provides some fantastic insights into your site’s SEO and general “health”, that it’s impossible to ignore. At its core, Search Console allows you to monitor and manage your site’s presence in Google search results. Based on Google’s respective help page (and from my experience), Search Console can help you in many ways; it’s really an invaluable tool! 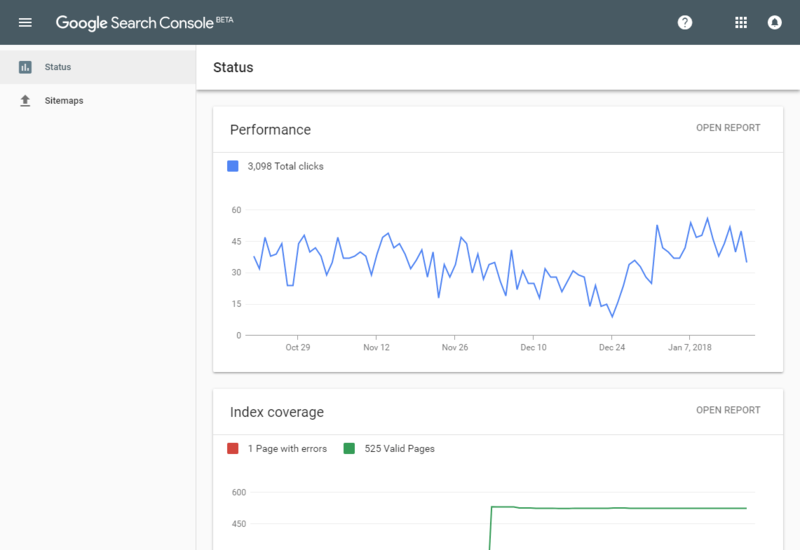 The redesigned dashboard in Google Search Console’s new user interface. Seeing that I’m such a big fan, here are some important pages inside your Search Console account that you might wish to check from time to time. Type: Tools Importance: 2/5 Difficulty: Easy Total time: 15 min. You can’t be serious about SEO and not use a good analytics tool. Unless you need very advanced reports (heat-maps, scroll-maps, mouse tracking etc. 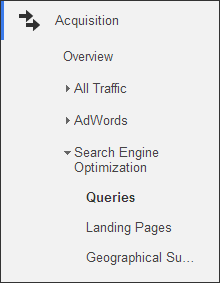 ), Google Analytics is powerful and detailed enough to keep you covered. Setting up should be pretty straightforward, just follow this checklist: Google Analytics Training – Get the most out of your reports. Google Analytics has a good integration with Search Console (of course), and you should definitely configure it and then learn to use those SEO reports. The integration can be found in the Admin area, under “Property Settings”. Reports are in the “Acquisition” menu. More on Google Analytics SEO reports here: New SEO Reports in Google Analytics Now Here (Moz Blog). I can understand this can be a daunting task, so it’s not for the faint-hearted. Even if it’s not worth your time at this stage, or it goes beyond your technical skills, you should at least read about it to familiarize yourself with the possibilities and take more informed decisions. Type: Indexing Importance: 3/5 Difficulty: Easy Total time: 15 min. For your website to show up in search results, Google has to know about all your site’s pages and index them. This can happen organically over time, but a sitemap is a faster way to “help” Google. Technically, XML sitemaps are well-formatted lists of your site’s pages, to help search engines “know” about your site structure and update frequency. This usually speeds up the indexing process. A respectable website platform automatically generates an XML sitemap file for search engines. But depending on how your website is built, you might not have a sitemap, making it more difficult to get indexed by search engines. So by all means, check with your developer to ensure that your site is generating a sitemap file and that it then gets properly submitted to Google Search Console. Alternatively, you can create them yourself using tools like https://www.xml-sitemaps.com/ or http://www.web-site-map.com/. If using WordPress, this feature should automatically be included in the excellent “Yoast SEO” plugin. You just need to enable it by going to “SEO > XML Sitemaps”, and it will then automatically generate a sitemap for all your posts, pages, categories etc. and then submit it to Google & Bing to speed up their indexing process. 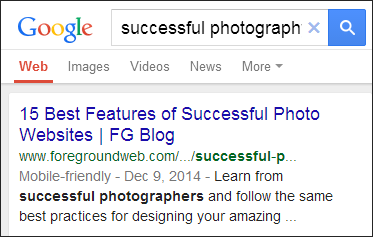 It also your post images into the sitemap, allowing them to rank higher in Google’s Image search. The robots.txt file sits on in a site’s root (www.johndoe.com/robots.txt) and is a tool allowing you to restrict search engine from crawling specific pages or parts of the site (as well as indicate the location of your sitemap). It’s perfectly fine to not have a robots.txt file (and thus allow all bots to index your site), but there might be scenarios where you’ll need one to fine tune some details. Your Google Search Console account has a “robots.txt Tester” feature (in the Index coverage section) which allows you to double-check that Google can access your site’s pages. Here’s an excellently written “Guide to the robots.txt file”. And another good one. Type: User engagement Importance: 1/5 Difficulty: Medium Total time: 20 min. While using Like/Tweet/+1 buttons is not traditionally known for its SEO benefits, it’s clear these days that Google is also using social media signals to rank websites. Consider it “social proofing”: there’s a strong degree of correlation between social activity and top search results. Profile links are great, they raise awareness to your social media channels, you should include them at least on your Homepage and About page. But sharing buttons are what we’re referring to here, and what you should consider including into every page of your website (especially the Homepage, all gallery and image pages, all blog posts). Adobe Flash used to be a cool technology; it allowed creating some attractive designs (animations, crossfading, full-screen slideshows etc.) But HTML5 and CSS3 have advanced so much lately that there’s no longer a reason no to use them to create amazing photo websites. And Apple’s lack of support for Flash on iOS devices has sealed flash’s fate. You can no longer honestly look at quality responsive WordPress themes online and still find a compelling reason to use Flash instead. Yes, I know, it’s that Flash thing again, you’ve probably read about it already in other articles online. But it’s worth revisiting the topic from an SEO perspective. While Google has made big improvements in Flash indexing, here are 7 compelling reasons why search engines and Flash still don’t mix. While iframe HTML tags have their uses, it’s best to stay avoid using them. Google can technically crawl links in iframes, but not without serious problems. So unless you have a solid web-design background and/or need to pull content from your own domain to show on other pages, consider hiring a web-designer to rebuild your site properly. Most people hate intros of any type: flash animations, slideshows etc., anything that blocks from reaching the main navigation and homepage content. Especially annoying are intros that can’t be skipped (easily or at all). Most of the times when this happens to me, I immediately close the site, I feel that the site owner doesn’t really respect my time, trying to force me to view something. Splash pages can theoretically serve many purposes (selecting site sections/language, making announcements, displaying ads etc. ), but none of them justify blocking the user from getting to the initial content. While it’s understandable why Google would penalize sites with too many ads, the most important SEO implication comes from user experience. All of those things can be displayed in a less intrusive way in between the content blocks (a sidebar, a top bar, a slide-in popover if you must, language flags, audio symbol with the sound turned off by default). If you are keen on adding an intro for an important announcement, at least make sure the main menu is visible, and/or there’s a clear way to skip or close the intro. Google picks up on all the small site engagement signals (time on site, bounce rate, pages per visit etc.) and “values” your website accordingly. Type: Indexing Importance: 4/5 Difficulty: Easy Total time: 10 min. Your website should not show up both as www.johndoe.com and johndoe.com (with and without “www”) because they can be considered identical websites by Google (and punished for “duplicate content”). If using WordPress, just go to Settings > General and update both the “WordPress Address (URL)” and “Site Address (URL)” fields accordingly. You can also add the proper “301 redirect” from one to the other in your hosting administration panel (instructions). Type: Indexing Importance: 3/5 Difficulty: Easy Total time: 2 min. Ever visited a WordPress site and saw this type of URL? If your site does this, don’t take it personally but please know that you have ugly permalinks! There, I said it. :-) What are you going to do about it? Just go to Settings > Permalinks and set it to “Day and name” or “Post name”. If you’re using PhotoShelter or other image management platforms, everything’s already taken care of: the URL actually contains SEO-valuable info taken from the image’s IPTC info, so Google has something more to “chew”, which is great. Leaving Google aside for a moment, pretty permalinks are also great for users who like to share your content (they either copy-paste the URL from the browser address bar into a page or email somewhere or they share it on their social media profile): a nice-looking link is more inviting, you’ll simply get more visits. Aaaand we’re back to Google: a good user experience gets noticed and helps your site rank higher in search results. If you‘re not using WordPress on your site, skip this. One of the most acclaimed plugins is “Yoast SEO”, so I definitely recommend giving it a try. It’s what I’m using for this article as well. For starters, it allows you to define your title & meta description tags for all pages and posts on your WordPress site. But there’s a lot more stuff the plugin does behind the scenes, including generating and submitting a sitemap for you (mentioned above). This excellent article will teach you how to configure all of the advanced settings in the Yoast plugin. In short, <title> tags define the page and are used by search engines in search results previews. They are also displayed by browsers (usually as the tab title) and used by social media for sharing snippets. 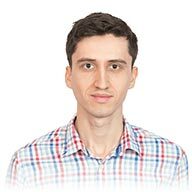 Dedicate some time to write unique titles for all your main site’s pages. No need to force keywords in there, just try to accurately describe that respective page. If you do use keywords in the title, placing them in the beginning gives them more power. Also important for people scanning search results, they notice early words first. Branding text (“John Doe Photography”) usually goes last, preceded by a pipe character (“|”) or a dash to separate it from the rest of the title. Refrain from using repetitive/boilerplate titles, Google will appreciate it. Length-wise, limit yourself to around 50-55 characters. Anything more usually gets truncated in search results. When possible, adding modifiers can help you rank better: 2015, review, best etc. On a lighter note, the longest <title> tag I’ve seen was 327 characters long included the photographer’s name 4 times and had a ton of comma-separated keywords. A perfect keyword stuffing example. It is highly important for how search engines “understand” the page and for gaining clicks from search results pages. The common mistake is to try to cram the meta description with keywords, hoping it will help with SEO. Google is not using it as a ranking factor, so that’s a false expectation. Instead, the best thing you can do is to focus very little on keywords and instead simply compel the reader to click and find out more. The small SEO benefit (from including keywords) is dwarfed by not sparking user’s interest and not getting their click. Write for humans, not search engines. Convince them the page is worth a click, and do it honestly. Keep it shorter than 158 characters (including spaces). If you make it longer, it will get truncated in search results. On mobile, Google displays a maximum of 120 characters. Once again, don’t repeat meta description, don’t use boilerplate text, don’t end with branding copy here too (“Description… | John Doe Photography”). Your meta descriptions need to be improved; they weren’t considered good enough by Google, especially when they don’t accurate describe the page content. The search query better matches some other parts of your content. Google knows best. Touching on this last point, some people decide not to define any meta description whatsoever, basically letting Google choose whatever snippet is most relevant for the search query. This is a valid strategy. So my recommendation is this: if you can write compelling and honest meta descriptions, do it, it will yield the best results. Otherwise, let Google extract it from the page content as needed. Type: On-site Importance: 1/5 Difficulty: Easy Total time: 5 min. This one’s easy, but I still see people doing this, so I had to mention it. Search engines have been ignoring keywords meta tags for years, so using them aggressively these days could only hurt your site or even get it flagged as spam. Simply remove them from your site. Displaying IPTC keywords on image pages is a whole nother deal. More on this later. While the “About” page is a great place to include valuable content for search engines, it’s even more important for building trust with your audience (which in turn becomes an SEO signal). Although this page rarely shows up in search results on its own, it’s probably the second most visited page on a website, with big SEO value, especially if your photography website Homepage is more image-heavy (like a full-screen slideshow). 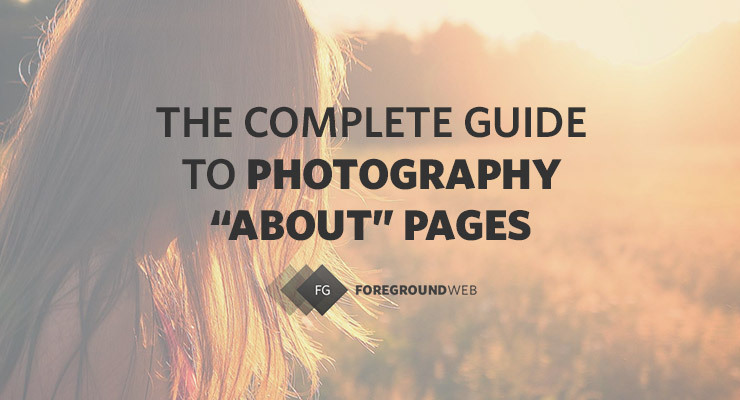 The complete guide to photography “About” pages explores all the main details that go into creating a great “Bio” page, including tips on writing your SEO title and meta description and quality examples from photography websites. Set some time apart to read it fully and improve your “About” page. OK, you’re a good photographer, and you want to convey that by displaying your images. And not just anyway, but maybe with a full-screen impressive slideshow on the Homepage, because that creates the most visual impact. That is partly true, but you’re also shooting yourself in the foot with regards to SEO. That’s because “letting your photos speak for themselves” might work with humans, but not with Google. SEO titles, meta descriptions and image ALT tags help, yes, but your should also consider adding at least a small paragraph of text in there. If not for Google, then just for first-time visitors wanting to quickly know what the site is all about. Compromise: huge slideshow/images at the top, text at the bottom (“below the fold”). Compensate: make sure your other main site pages make up for it, text-wise. To start with, I recommend reading about long-tail keywords in Moz’s Beginner’s SEO guide (chapter 5) (scroll down to the section titled “Understanding the Long Tail of Keyword Demand”). If you’re stuffing the phrase “Boston fine-art photographer” throughout your site, hoping that will rank you higher for this local search, your efforts might be in vain. It’s a highly competitive phrase, and you run the risk of over-doing it and being penalized by Google. Adding such niche keywords is the solution to the long-tail SEO strategy. Focusing only on top phrases, you miss up to 80% of the search traffic. Trying this shift in SEO strategy (from popular phrases to multiple niche phrases) should lead to more variety and more search engine visibility. WordPress does this automatically (depending on your theme), but it’s useful to double-check (by reading the theme documentation or simply right-clicking on the headline and choosing “Inspect element”). Heading tags usually also come with proportional font-sizes. But this doesn’t mean that you should use an H1 tag wherever you need larger text, which would have a detrimental effect on your SEO. 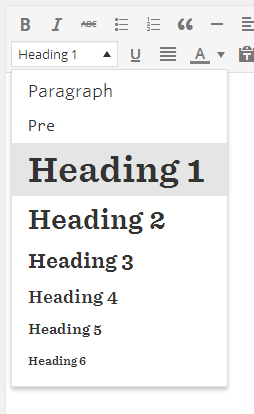 Styling text is done with CSS. And never use more than one H1 tag per page, that would be over-optimization. It’s perfectly fine to use several H2 and H3 tags to break up the content into separate sections though. Type: On-site Importance: 1/5 Difficulty: Easy Total time: 10 min. The date is automatically picked up by Google from the post‘s date in the byline. Google loves fresh content. So posting dates (publish date or, better yet, last-modified date) in blog posts is a great way to make your search results more enticing. Google also automatically gets post dates from the XML sitemap you submit, but adding dates as text in your themes helps too. The footer is supposed to be just a nice ending to a page, a small please with contact info and maybe a few navigation items to help users browse to a new page. Instead, it is often over-optimized and it becomes a dumping ground for a lot of content that doesn’t fit elsewhere in the site. The only type of footer optimization that you should do is not to do it. This goes hand-in-hand with my footer notes above. Site-wide links are commonly present in footers or blog sidebars (using “Blogroll” widgets). Google is obviously taking a rational approach: more (duplicate) links lose a lot of their SEO value. So it makes no sense to link to friend or industry sites in your blog sidebar, those links are heavily disregarded. You’re simply “encouraging” people to leave your site instead of making them stick around your site longer. Let’s look at it from another way too: on a single blog post, do those sidebar links relate to the topic at hand? Most likely they’re not, so it might make more sense to place them only once on the Homepage, or to remove them altogether. Out of the box, WordPress comes with a lot of taxonomies: daily/monthly/yearly, category, tag, author archives. If all of these exist and are indexed by Google, they could be seen as duplicate content (and therefore hurt your SEO). Don’t try to “game” the system. Yes, you know who you are! Don’t force keywords into your content. Repeating certain phrases in all your page titles or gallery names is frowned upon. You should instead craft your text so that it always reads naturally. Don’t use invisible texts. Search engines are becoming really smart, they can detect if you set the text color to be the same as the background in order to hide keyword-heavy texts from users. Don’t buy links. Purchasing links to your site from link farms has already gotten out of hand a few years ago, it can now get your site banned from search engines. 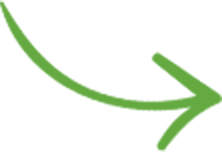 Let your incoming links grow organically! First of all, don’t blog only for SEO purposes. Even if you’re working hard to optimize your posts for Google’s eyes, make sure you’re also writing quality content for humans (great storytelling, personal recommendations, honest opinions). Stuffing your blog posts with keywords can make them “smell” of spamming, you risk alienating your audience. Otherwise, if Google find’s your page to have a high user reading level, your site will sometimes be marginalized. I’m sure you’re aware of the current trends towards smartphones and tablets, more and more people are browsing website when on the go (or when standing still, on their sofa, on their tablet, for convenience). Your website should not force mobile users to have to pinch and zoom, and that’s where responsive sites come into play. When being viewed on a small screen, the layout and content of the pages adapt to the screen size, resizing and repositioning elements as needed to create a good experience. 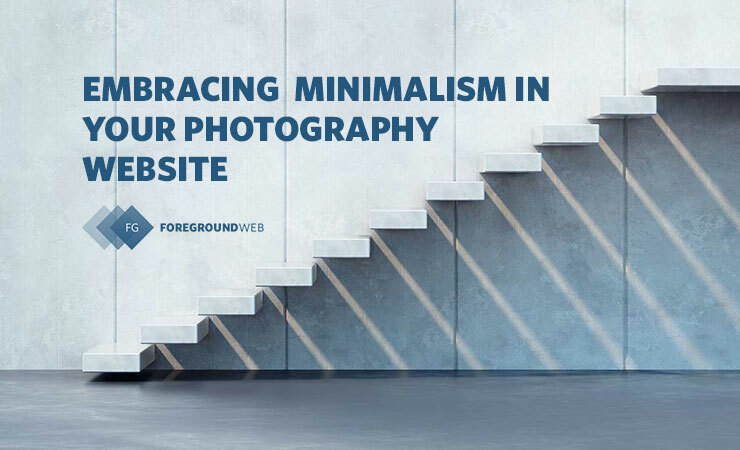 This is especially important for photography websites, which should automatically resize images to fit the screen size of the user’s device, and still keep it interactive (ex: swipe to change images). To make things even more important, Google recently started displaying a “Mobile-friendly” label to responsive search results on mobile devices. This provides a great signal for users that they’ll have a good browsing experience, and Google is rewarding that. A responsive site provides a great browsing experience for your users, and Google is rewarding that! There aren’t any simple shortcuts you can take to make your site mobile-friendly, it’s something you should consider investing in a web-designer for, or at least test your website with the free tools below. Once you do make your website responsive, and have confirmed it Google’s free tool, make sure Google Search Console also no longer lists any pages as having errors. Only a small percentage of your website visitors are returning users, people who are already aware of your work and have the patience to read your content carefully. The large majority of your traffic is most likely made up of first-time visitors, with a short attention span. They don’t sit down to fully explore a website, they just quickly scan it (in various predictable patterns) to see if it fits their needs. That’s why overwhelming them with too many options can, in fact, lead them away. When a user lands on your website, Google “notices” if they bounce back to search results, or instead they start browsing through your site. Optimizing bounce rates obviously comes down to having a clean and modern website design, a site that increases user engagement (through useful internal links, calls-to-action, well-written copy etc.). Photographers are sometimes overly-concerned with the visual aspects of the site, at the expense of usability. Important areas of the site should be accessible in as few clicks as possible. Don’t just rely on people using their browser back/forward buttons. Help them navigate through the site with links back to parent galleries/categories. And don’t forget to gather feedback from other people testing your site (either directly or on a global level using Google Analytics), it can be very insightful. Notes on menu items: Carefully consider the actual words you use in your navigation. When browsing websites, people instantly recognize familiar names for navigation links. Your site should, therefore, avoid using weird names for menu items, they only slow down users in taking a decision, they hurt the website’s usability. One of the most frequent mistakes is calling your Contact page something like “How to reach me/us”. Some people link to a Services page using “What we do”. Always try going for simple one-word navigation links, and browse around for website examples to see what other people are using. Notes on menu dropdowns: try to keep them as few as possible, they are usually annoying to visitors and they also make people skype the top-level menu options, reducing the visits to your more important pages in the site. Notes on image thumbnails: in rare cases, photography gallery pages only allow clicking on the text underneath each thumbnail (usually the image title or filename). Make sure your entire thumbnail is clickable on your site, not just the text. It’s a visual medium, people expect to be able to click the image directly, it’s a larger target for the mouse pointer. Regular visitors hate slow websites. Photo buyers hate slow sites. Google does too. There’s a clear pattern here. Site speed is an important reliability factor in SEO algorithms. Most of the time, you’re locked into the page structure provided by your CMS, and the same goes for web server optimization. But there are a few things you can do to reduce website load times. First of all, don’t underestimate the importance of a solid web hosting provider. If your server is slow, it doesn’t matter how you build your site, you could be waiting for several seconds before the first byte is received. I’ve had a good experience with HostGator so far if you’re looking for an inexpensive solution (and unless you’re relying solely on hosted image management solutions like PhotoShelter). If you have a WordPress site and you need top quality, go for WPEngine. If you’re using WordPress, caching can really improve your site’s load speed. Using a plugin like W3 Total Cache does all the hard work, the principle is simple: it creates copies of your dynamic content as HTML pages (among other things) and serves them to browsers instead of having to generate all the content for each visitor. It can also help integrate with a CDN for greater speed unless your website (or hosting provider) already does this. Investing in a quality theme and/or a professional web-developer to make your website fast will pay dividends, in the long run. A big part of your visitors will leave the site if it takes too long to load, even if have quality content. Besides taking an overall look at your site performance, also check how big your images are being displayed on the site, and only upload images of that size. I’ve seen this happen very often: browsers struggle to load full-resolution images simply to then resize and display them at 1000 pixels or less. Make sure your images are exported/uploaded at a good size (as dictated by their display size on the site), saved as JPG (instead of PNG, TIFF, RAW), and a decent compression level (60-70% quality, as low as you can without starting to introduce too much noise, it’s a compromise). There are obvious exceptions for this: if you plan on offering prints and image licenses on your site, those need to use your high-quality full-size images (with security measures in place). But your site should be able to automatically generate smaller images just for display purposes, and only provide the high-quality images when actually needed. Compress your images online with Imagify (or their WP plugin), or use software like ImageOptim (Mac) / PNGGauntlet (Win) or others. Another time consumer sometimes is having too many images in a bad slideshow. You need to make sure that you slideshow loads images dynamically as you navigate through it. Some websites still need to wait to load all images before starting the actual slideshow, which is obviously a bad thing. Besides your photography, your website template surely uses small graphics/files for design. These can also impact site speed. Three very small social media icons can take more time to load than one single slideshow image (because it’s not just a matter of total file size, the browser has to make a bunch of server requests for files, and these take up precious time). A good read is Google’s “Image optimization” guide. It provides everything you need to know about optimizing site graphics: file formats, compression types, vector graphics, retina display implications etc. That value inside that ALT tag is the main point of interest for Google when looking to “understand” an image (the others being the filename and the text around the image on the page). Search engines don’t have the practice of looking into IPTC/EXIF information yet, so you can see why the ALT tag is important if you care about SEO. Browsers also usually display the ALT tag in a tooltip when hovering over an image. The (recommended) maximum length of the ALT text is 16 words though this is hard to test. And no comma-separated keywords here, it should either be descriptive/helpful or none at all. Your website platform should ideally automatically fill-in the ALT tag using one of the main IPTC fields (like PhotoShelter does), or at least allow you to easily define it (like WordPress does). Filling alt attributes with keywords (“keyword stuffing”) results in a negative user experience and may cause your site to be perceived as spam. Instead, focus on creating useful, information-rich content that uses keywords appropriately and in context. Sure, you might be displaying IPTC fields for your visitors. But what about filenames? Search engines cannot understand the contents of an image (yet), all they can understand is that your image contains a… DSC0001. Or they find out that in your photo there’s a person called… IMG0004. Nobody will search for that on Google. It’s true that image ALT tags, along with IPTC information, are responsible for properly describing an image. But filenames simply provide extra info about your images to search engines. And if your images do show up in Google search results, filenames are sometimes used as description snippets, thus being of value to the users too. So just like with ALT tags, it makes sense to add descriptive keywords into the filename, instead of leaving the default camera-assigned ones (DSC0001.JPG). A side-effect of having keyword-rich filenames is that images become more likely to show up in Google Image search results. Not only does this affect SEO, but how are people supposed to always know the contents depicted in your photos? Rosa Frei displays image IPTC details (as well as searchable keywords) under enlarged photos. Well written captions can make people relate to your images. Same thing applies to gallery descriptions: it’s a great way to inform visitors about that specific group of photos. The first step is obviously to add IPTC info to all your images in your preferred image management software (like Adobe Lightroom), before uploading them to your site. Displaying that IPTC info is only the second step and should simply be a matter of enabling it in your CMS of choice. 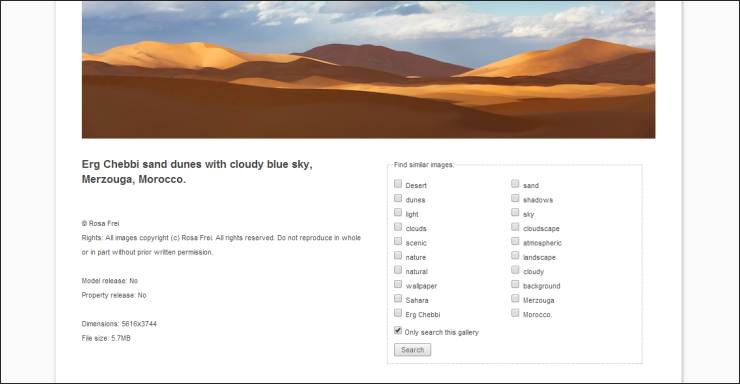 Looking into the future, Google is starting to understand what an image actually contains, it looks quite interesting. But until it does it well (and that’s a big “if”), manually-entered metadata is all you can do to help your SEO cause. I big trend in the SEO world is toward local search. Both mobile and desktop search results are starting to display location-specific results (even when there was no location being asked for as a keyword), by using your device’s IP address or your networks public location. So if your photography business has a local component, optimizing your site to tailor to that specific area is a must. As locations-specific queries become more popular, your location can sometimes make all the difference for clients staring confused at Google search results. Firstly, let’s start with WHY. 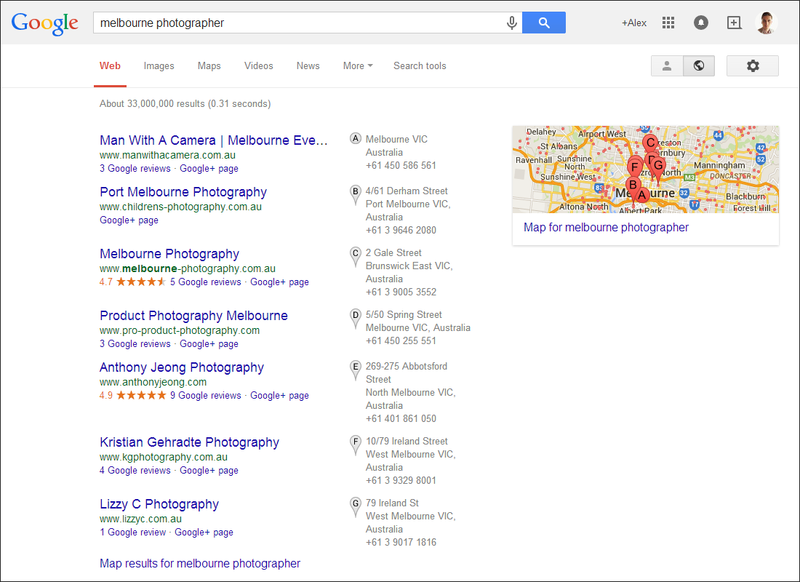 When doing some geographic-specific searches (like “melbourne photographer”), Google sometimes displays a huge Google Maps component above the standard results. It’s obviously great if you can reach that list, and it all starts with you creating a free Google My Business account. If you’ve previously heard about “Google Places for Business” or “Google+ Pages”, they’re all the same, they’ve been re-branded into “Google My Business”. Extra tip: if you have an embedded Google map on your Contact page, be sure to point it to your actual Google My Business location directly. Before we dive into link building strategies (the “bread and butter” of SEO), it’s important to first note the importance of anchor texts. You can read photography web-design articles here. 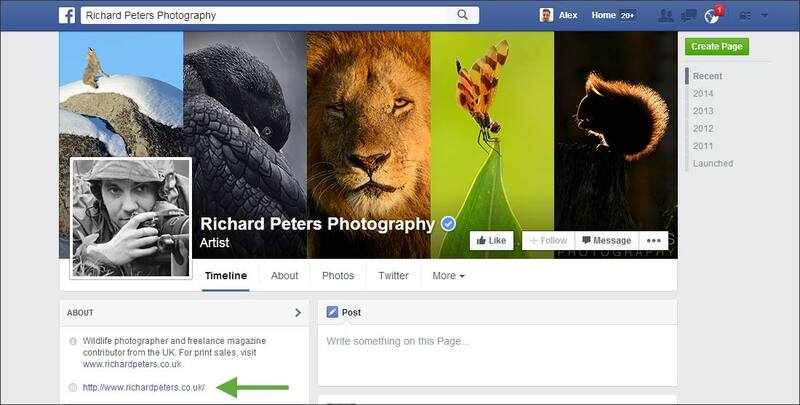 Go here to read photography web-design articles. It’s an over-simplified example, but you get the idea. In the first example, Google understands that the website is about… “here” (although it tries to understand a little more of the entire sentence, not just the anchor text). In the second example, there’s a lot more context in the anchor text. So whenever you have links pointing back to your site, try to improve their anchor text, it can greatly improve yourSEO in the long run. The quantity and quality of incoming links to your website (“backlinks”) are huge SEO factors. Link building is the hardest (and most powerful) parts of SEO. Search engines like Google consider backlinks as “votes of confidence”, therefore ranking you higher for the keywords that fit the bill. Inside each of those profile pages, you can most likely place a link to your own site. Besides these self-created links, and excluding buying links from the equation, you’re left with the natural process of gaining links over time. There’s no shortcut here, no quick tip you can employ. It’s just a matter of creating worthy content day in and day out, and your ability to raise awareness about it. Tracking inbound links can be done in Google Search Console or using tools like MOZ Open Site Explorer. Type: Off-site Importance: 2/5 Difficulty: Easy Total time: 20 min. I don’t need to tell you that social media is crucial these days to running a successful business. And especially a photography business (since photography is such a powerful medium). But you should never lose sight of the big picture: your own website is the core of your business. Social media profiles are just marketing hubs, allowing you to spread the message, to promote your work, and to bring people back to your site. And while you’re at it, also set up an effective email signature. Sometimes you will get low-quality backlinks (from hiring shady SEO companies to buy cheap links for you, or from trying to get unnatural links yourself). Google is obviously against spam links of any kind, so, once in a while, you should clean up your backlinks. There is this myth of losing “SEO juice” if you link to external sites, making people not link to other sites (or just link internally). SEO doesn’t work like that. Not to mention that you’re not serving your audience/readers best, you’re hiding links from them for your own perceived benefit. You can see that after each SEO action in this article, I’ve included a “Further reading” section, linking to relevant quality articles online. Is it helpful to you? If so, why would Google “punish” my site’s SEO, it makes no sense. So when you’re blogging, don’t be afraid to link to other sites, and instead focus on producing your best content. Properly testing your site before launching it should not be neglected. But even afterward, it pays to do a monthly review of the entire site and check your new/recent content for mistakes (new blog posts, new gallery descriptions etc.) and double-check your contact info. You’d be amazed how many photographers changed their phone number but then forgot to also update their site’s contact info. And don’t just try to review it yourself, you need “outside” people to give you feedback. A fresh pair of eyes can spot a lot of small details. A site tester (even if it’s just a friend or relative) can give you some interesting insights (“I was confused on that page, I didn’t know where to contact you…”) or report weird things (“Everything was fine in Safari, but I tried your site in Firefox and the homepage was all messed up…”). 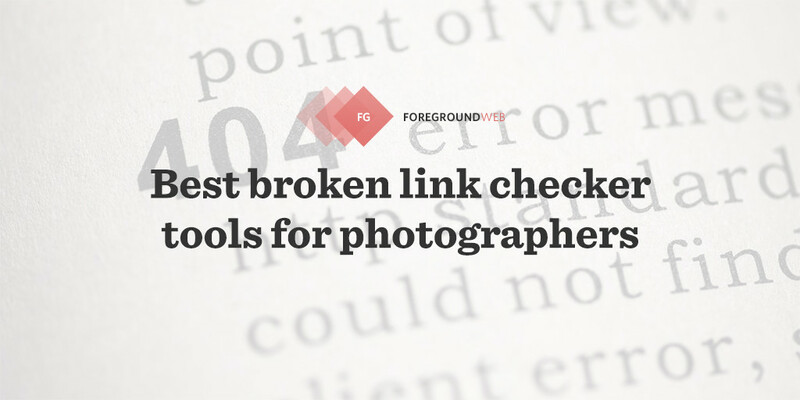 Broken links send users to non-existing web pages, so they’re obviously important to not have. They can be bad for your site’s usability, reputation, and SEO. If you find broken links in the future, take the time to replace or remove each one. For inbound links (“backlinks”), you can use the Google combo: Search Console (Index coverage) and Analytics (to spot visits landing on a 404 error page), and then you can fix them by either asking the site owners to a link update or adding a redirect yourself. After all your hard work on the site’s SEO, it’s time for testing. You should spend some time going through some of these tools and figure out which ones give you the most valuable insights, depending on your goals. You’d be amazed how much difference a good tool can make, displaying SEO data in new creative ways. Fortunately, there are a number of free tools that can help you reach your SEO goals. They all have slightly specific purposes, but building a good arsenal of powerful tools will make you master the game of SEO. Type: Planning Importance: 2/5 Difficulty: Easy Total time: 30 min. If you’re serious about your website, measuring your SEO progress on a regular basis is a must (I recommend at least once a month). SEO is not a one-time effort. What I like to do is to bookmark all pages (including social media accounts, news sites, and anything else that I need to check on a regular basis), group them all in a folder (your browser most likely allows bookmark folders) and then open them all at once. Like a regular website “health” check. There are obviously many things you can do to maximize your site’s SEO and ultimately get found online & improve your photography business. If you’re not leveraging SEO to get more website traffic, now is the best time to start! And if you only took one main idea from this article, it is this: search engines are looking more and more closely at user experience signals across the web, at how users browse your website, instead of relying only on keywords and links to rank websites. SEO is no longer focused solely on keyword-rich copywriting but on providing the best possible browsing experience for your target audience (with a fast, mobile-friendly and honest website). Build an amazing photo website that people love, and Google will follow! Hope you find this SEO guide useful. I’d be very grateful if you’d help it spread by emailing it to a friend or sharing it on your social media profile. Thank you. Here’s to better photography websites! If you’re overwhelmed, you can hire me to work on your site’s SEO. My in-depth SEO review (exclusively for photographers!) includes everything comprehensive on-site SEO work and 1‑on‑1 consulting to help move your website hire in the rankings.